Info "The top is still underdone. Flip it over!" Over Easy is a Microgame in WarioWare: Smooth Moves. It is in Mona's stage. 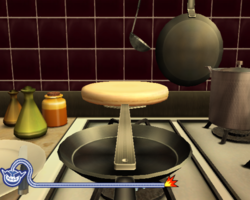 The player must flip food in the frying pan. It is very simple but if the player overreacts and flips it too strong or moves the Wii Remote forward, the food will fall out and the player will lose. 1st level difficulty: The player must flip a small pancake over. Once done, a stack of pancakes will fall on the initial pancake and butter, maple syrup, and silverware will fall neatly next to it. 2nd level difficulty: A normal sized starfish is on the frying pan. Once done, a stack of starfish will flip on the plate. 3rd level difficulty: A large, live and flapping fish is on the frying pan. Once done, the fish will wiggle a bit on the plate, then bounce off. This page was last edited on February 19, 2018, at 17:05.